The fifth principle I am committing myself to live by is the principle of Self Responsibility – realizing only I am responsible for what I accept and allow inside of me, my relationships and my outside world and so with this responsibility: only I have the power and ability to change that which I see is compromising who I am, what I live and how this affects others. What this simply means is that I do not search for excuses for my thoughts, feelings and emotions and actions or situations that I am in, because by blaming others for it, I take the power to change away from myself. Therefore, by taking Self Responsibility, I direct myself to look at the causes of my thoughts, emotional reactions and behaviors and habits and look at myself in self-honesty to see, how I can change myself and become a more effective human being, how I can be a practical example of how anyone can change self and start living according to the principle "do not do unto others what you do not want to be done onto you". I do this practically through writing, applying self-forgiveness and self-application, where I first see and realize how I can change and then actually do it in real life. 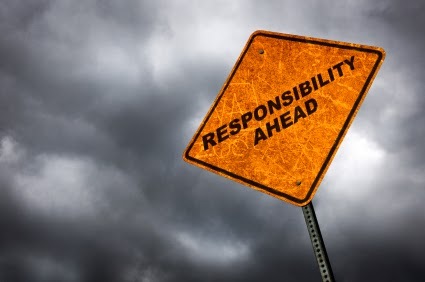 It is so simple, but often we do not want to hear about it - Self Responsibility - because we often don't want to direct ourselves and make responsible decisions. We would much rather "go with the flow", which basically means that we would just like to follow our desires for good feelings and avoid everything where we feel bad. But the fact is that we create these feelings, both good and bad, and so as long as we have these feelings that we subdue ourselves to, we do not have any freedom of choice. We like to say that we want to do something because it is our freedom of choice, while in fact we want to follow our feelings and emotions, because if we would not, we would feel bad. But his means that we have no real freedom of choice as long as we allow our feelings to direct us! Therefore, it is important to see and realize that we ourselves create our own feelings and emotions that we then subdue ourselves to, therefore abdicating our responsibility to make decision that are best for all. This way we abuse others as we do not consider the abusive consequences of our selfish actions that are based on feelings and emotions. This is not acceptable. Therefore, taking full self-responsibility for our thoughts, emotions and feelings and actions is very important if we want to free ourselves from our own self-abuse. When we become Self Responsible and take our future into our own hands, we become more stable, calm and response-able, no matter what is going on in our lives. This way we also create Self Trust, where we become certain that we will always do our best to deal with any problems that we face and so resolve them not only in a way that is best for ourselves, but in a way that is best for all. This is how we then expand ourselves to not only stop at ourselves when our life is stable, but to also actively participate in the world and with others in stopping and removing the abuse of Life and other problems that we have on Earth, because we realize and understand that this is what is best for all and so best for ourselves, because this way we make sure that we treat all others the same way as we would like to be treated- And so we are doing our part in creating a world that is best for all. This is what Self Responsibility actually is. Follow this link to see the full list of principles I am committing myself to live by.